True to form, an autocratic executive wrapping up a real estate deal is trying to wiggle out of paying contractors. The project, a gleaming, fortified executive residence and business headquarters, is a veritable castle in the sky. His idea was to get all his subordinates — including his aggrieved wife, obsequious family members and a dirty trickster — under one roof so he can better control them as he continues enhancing his dominion and power. Not so fast. 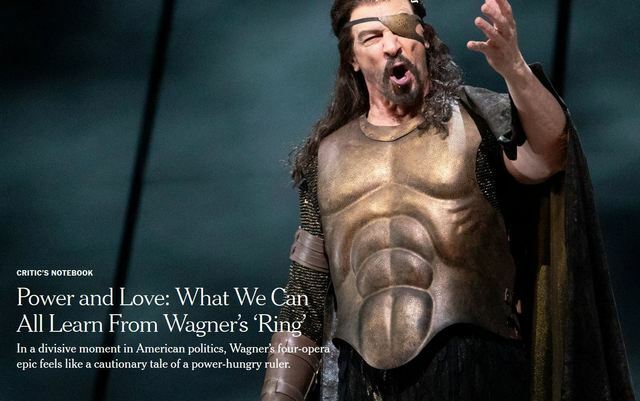 It’s actually the gist of Wagner’s “Ring” cycle, which the Metropolitan Opera is presenting — in a retooled revival of Robert Lepage’s intensely-debated production of the four-opera epic — through May 11. Since the first complete “Ring” production inaugurated the Bayreuth Festival in Germany in 1876, Wagner’s saga has been milked for its perceived politics. Early audiences saw echoes of revolutionary currents that had swept 19th-century Europe. The work was soon seized upon to support various ideological agendas: a Marxist narrative of class struggle; an allegory of environmental degradation at the hands of rapacious industrialists; a multigenerational drama about a dysfunctional royal family. The “Ring” has also been viewed as a cautionary tale of a power-hungry ruler — or mogul — who goes too far. Modern stagings that present Wagner’s flawed hero, the god Wotan, as if he were the chief executive of the Valhalla Corporation have become almost commonplace. In this divisive moment in American politics, the “Ring” may feel newly relevant, epitomized by Michael Cohen, the former lawyer for President Trump, pointing to himself during recent congressional hearings, warning of what can happen when you are dazzled by power. For one, the “Ring” depicts a world that functions through a codified system of checks and balances and agreed-upon norms. Wotan, though the head god and patriarch, is not all-powerful. He must contend with a sort of cabinet of sub-gods with their own areas of authority. But he has stacked his regime with cronies and has brazenly flouted the standards and protocols meant to rein in executive overreach. It’s a crucial plot element, and not simply a costume accouterment, that Wotan carries with him at all times a staff that has the runes (the codes of his realm, like the articles of a constitution) carved into the wood — a symbol, and perhaps the source, of his power. Of course, this imperious ruler cites a particular rune when it serves him and simply ignores those that prove inconvenient. Another strand of the myth that may leap out today concerns the way the personal becomes the political in the life of a ruler like Wotan. The “Ring” has been interpreted as an allegory about the relationship between power and love, and the difficulty of obtaining both in one’s life. That’s the way I see it. It’s crucial that the secret to the magic gold the three Rhinemaidens keep safe in the depths of the river involves a choice, in effect, between power and love: Anyone who renounces love and takes the gold can fashion a ring from it and become master of the universe. Wotan craves both power and love, a tension that plays out poignantly in his relationship with Fricka, his exasperated (and childless) wife. But it’s Alberich the dwarf who acts first. There are eerie resonances, too, in how Wotan and Alberich, opposing characters, become obsessed with the ring. Alberich literally stumbles upon the magic gold when he makes advances at the Rhinemaidens, who find him laughably hideous. Rebuffed and humiliated, he steals the gold in an I’ll-show-you-all act of vengeance. But Wotan, who has heard of the gold and its power, was content to leave it be, until the moment when we meet him in “Das Rheingold.” Now he needs to pay his contractors. And beyond that, once he learns what Alberich has done, Wotan feels threatened. He must get his hands on that ring, on that power — whatever the cost to his governing legitimacy and personal life. You may also find one other theme uncomfortably familiar: heads of state near and far granting governing authority to family members. Having made a hash of things and violated the very codes he had sworn to uphold, Wotan must somehow make corrections. Knowing that his own hands are tied, he fathers children hoping that one of his descendants (perhaps the hero who has been prophesied) might take over his domain and, exercising free will, right his wrongs, while still maintaining power. But it doesn’t look good. His narcissistic greed and power grabs have caused havoc in the world. The ring (now in possession of the giant Fafner) is cursed; the natural order has been disrupted; the only hope of averting the inevitable global calamity (which brings to mind climate change) is for the ring to be returned to the river. Since Wotan also craves knowledge — knowledge is power, after all — he pursues Erda, the all-knowing earth goddess, who comes to warn him about what will ensue if he keeps on his heedless and destructive path. They end up having nine daughters together, and he raises the girls as Valkyrie warriors to do his bidding. But only Brünnhilde, his favorite, seems to know his mind. “Who am I if not your will?” she asks in an intimate moment when Wotan seems troubled. What follows is the rare confessional scene among numerous tales of fearsome, all-powerful fathers, when Wotan tells Brünnhilde the woeful story of how he has broken the covenants and mismanaged his life. This aspect of the “Ring” always reminds me of the scene in “The Godfather” in which the ailing Vito Corleone confides in Michael, his trusted son. “I never wanted this for you,” Vito says. He had hoped that, after lawlessly building an empire, by this point he would have given the family business a legitimate veneer and groomed an heir who could prevail within the establishment. Senator Corleone? Governor Corleone? “We’ll get there, Pop,” Michael replies. By the end of the “Ring” cycle, the immutable forces have won out, just as Erda foretold. The game is up and Wotan must face the inevitable. We learn that he has piled branches from the world tree around his crumbling castle, where he glumly awaits the end. Sure enough, as if doing her father’s bidding, Brünnhilde, who has been through hell, sparks a self-immolating fire that consumes the castle and its godly inhabitants. The cautionary moral seems clear: If you blaze a path to power, the flames may well consume you. The river floods the ashes and reclaims the ring. For better or worse, humans will have to go forward without the gods. The governing codes of conduct that were shattered will be restored. Or will they? That very question is roiling Washington as the “Ring” plays out at the Met.